According to the London-based Palestinian daily Al-Quds Al-Arabi, Israel has come to an understanding with Palestinian Authority leader Mahmoud Abbas to transfer custody of the Temple Mount to Jordan and to allow 90,000 Arab residents of east Jerusalem to receive Jordanian citizenship. The unofficial draft deal, made in the light of the approaching US sponsored Middle East Peace Summit in November, seeks to acknowledge Jordan's historic role as custodian Jerusalem's Muslim Holy Sites and build on principles established in the 1994 peace accord. Furthermore, there is discussion to trade control of Arab neighborhoods in Jerusalem in return for larger Israeli settlement blocs in the West Bank. "The most important thing is to preserve the Jewish and democratic state of Israel," said Vice Premier Haim Ramon in a Monday interview with Israel Radio. The Prime Minister's office has denied that any official agreement has been reached. The God of the Bible has had many disappointments with this secular Jewish State over the past fifty years, but the giving away of the Temple Mount by this generation shall go down in history as the greatest disappointment of them all. The joy of every Jew partaking in this miraculous Third Exodus is about to be extinguished. Horror in the Holy Land has replaced the joy for this generation of rebellious Jews who refuse to submit to the literal interpretation of the Bible. The Book of Leviticus must be obeyed! A greater horror is coming by allowing the barbarians to have full sovereignty not only over Judah and Samaria, but the only site for God's House of Prayer as is already being manifested in the reality of the continual Palestinian attacks on the Jews. I do not see joy coming out of this political Road Map solution aimed at bringing peace to the Holy Land. The intended blessings of 1967 are clearly become a curse! Greater horrors are in store for the Jews of this generation, and for the world. Hearts must be turned toward the only God of the Bible. The God of Abraham, Isaac, and Jacob. The God who kept His word bringing the Jewish LORD Jesus Christ to this Holy Land to redeem lost sinners via the way of Calvary. The God who is keeping His word this very day by establishing this miraculous Third Exodus so this same LORD Jesus Christ will have a Jewish nation for which to return! Friend, it is only a remnant who ever submit to Biblical authority. It is only a remnant of this present Church Age who have come to Christ for salvation. The Bible condemns the masses to hell for their rebellion. They reject not only this great God of the Bible, but His only begotten Son. Such rebellion will not be tolerated by the Biblical God! Friend, understand that you must leave the crowd, and come to Christ. Only then can you experience the joy of which the Bible speaks. Rivlin Calls on Shas: You Were Elected to Save Our Dream! (IsraelNN.com) In a moving, emotional Knesset speech, Likud MK Ruby Rivlin said the Shas and Yisrael Beiteinu MKs must act now to save Jerusalem - or else Israel's national dreams might be lost. IsraelNN.com) With Prime Minister Ehud Olmert preparing to offer parts of the Old City of Jerusalem to the Arabs next month, an apolitical association has begun a public campaign to prevent it from happening. The campaign is being run by the "If I Forget Thee - On Behalf of Jerusalem's Future" Association not only in Israel, but also in Jewish communities throughout the Diaspora. The goal is to emphasize the need to prevent Jerusalem from becoming a negotiable issue, and find ways to ensure that this does not occur. The association's ads have run in all of Israel's major newspapers - but have been rejected for airing on Israel's Second Television and Radio Authority, a governmental body, because they are said to be "politically controversial." On Wednesday afternoon, the Authority instructed its regional radio stations to remove the ads that were already accepted and not to air them. It is clear in the Bible that the peace of Jerusalem is directly associated to the House of the LORD our God! It is also clear the secular Jews of this generation oppose Biblical peace replacing it with the Road Map divided Kingdom plan. The building of the Third Holy Jewish Temple on the Temple Mount is paramount to this miraculous Third Exodus of our generation according to the Bible. 40 years ago in 1967 after the Sox Day War this possibility of building the Third Holy Jewish Temple became reality. The rebellious secular Jews of this generation dragged their feet until we come to this present day where they have now so deteriorated that serious planning is being given to abandon the site of God's Holy House so the Islamic barbarians can forever desecrate it. 40 years is a significant period of time. It represents a generation. God can now rage on this generation of Jews for their corporate failure in responsibility. The Jews of today living in the Land of Israel are without excuse! The blessing which they (this entire generation) turned into a curse can now be legally recompensed. I expect the Jewish heart of many Jews is about to be broken. I expect two Jews coming in the image of Haggai, and Zechariah of the Second Holy Temple era are going to come calling upon this generation to consider their ways! Jews in the image of Zerubbabel and Joshua will respond to their call, and with a remnant of obedient Jews build the Third Holy Jewish Temple! Friend, will you be obedient to the call of this Biblical Church Age era in which we live, and come to Christ for salvation? This dispensation is quickly coming to an end. The time is short. Soon Christ will be coming again, but not as the babe of Bethlehem. He is coming as the LORD of hosts! He is coming as the conquering King of kings, and LORD of Lords. He is coming again to redeem the Jews, and be their forever King. He is coming to the Holy Land, Jerusalem, and the Temple Mount! The Jewish Kingdom of Heaven here on earth is the Biblical plan for the next future event. The time for you to come to Christ is today. Repent, and cast yourself before Calvary. The price for sin has been paid. Today, the command is to come! 62 For Zion's sake will I not hold my peace, and for Jerusalem's sake I will not rest, until the righteousness thereof go forth as brightness, and the salvation thereof as a lamp that burneth. (IsraelNN.com) Mahmoud Abbas (Abu Mazen), the Palestinian Authority's chairman and head of the Fatah terror group, has agreed to resume a dialogue with rival terror group Hamas after the Annapolis conference, according to a report Saturday in Al Hayat. Abbas has denied the report. According to the report, which is based on sources within Hamas, Egypt will host the talks between Hamas and Fatah. "Many Arab countries tried to mediate and convince Abu Mazen to hold the talks between the two movements, but he asked for a postponement each time," the sources told Al Hayat. Recently, they said, when Abbas met with Sudan's president, Omar al-Bashir, the latter pleaded with him persistently about the need for a dialogue, and Abbas agreed to initiate it, they added. For Zion's sake, and for Jerusalem the God of the Bible has said He will not rest until righteousness and salvation prevails. The second coming of Christ is centered at Jerusalem and the Temple yet to be built by the Jews. The politicians of this generation think they are in control of both Jerusalem and the Temple Mount. How foolish their Road Map plans will become as the Omnipotent God who will never rest performs His will over the future of Jerusalem. Folks, understand what is happening concerning Israel, Jerusalem, and the Temple Mount. The Annapolis meeting is when the United States Evangelical President is going to pressure the Israeli Prime Minister Olmert to implement the blasphemous Road Map divided Kingdom plan for peace in the Holy Land. Already Olmert is on record that he will give the Palestinian terrorist groups (Fatah and Hamas) under the cover organization of the Palestinian Authority almost all of the Holy Land God blessed Israel with in 1967. It is 40 years, and this present Israeli secular government is intent under US pressure to give the barbarians Judah and Samaria. With Judah will go most of the old city of Jerusalem including Jewish sovereignty over the Temple Mount. The plan to make the giveaway of Jerusalem and the Temple Mount more palatable is to return sovereignty to the Jordanians who controlled them before the Six Day War of 1967. Jordan has refused in the past to take back these hot potatoes. They may refuse again possibly spoiling this latest modification to the Road Map? Apparently the give away is so fixed that even Jordan's refusal will not thwart the present plan. It will all illegally be given to Abbas as head of the Palestinian Authority which he officially dissolved when he fled Gaza. A straw man using Abbas was quickly reestablished by the Bush Evangelical Administration to save the Road Map. It is this straw man of which today's news item is about. Abbas is expected to return to the Holy Land with the promise of controlling all of Judah and Samaria. The rival terrorist group Hamas (pawn of Iran) who ejected him from the Gaza, and has both the power and ear of the Palestinian people must have a voice in all that is taking place. Abbas knows this, and feels with the power the promise of the Holy Land gives him he can now negotiate with Hamas for a good power controlling agreement for himself and his followers. I expect the results are only going to bring even more chaos to the Holy Land, and the eventual Islamic assassination of Abbas. (IsraelNN.com) The Patzael region in the central Jordan Valley, just 20 kilometers north of Jericho, was touched by a small earthquake on Saturday night, registering 3.0 on the Richter scale. A similar quake occurred in the same area two months ago. On Sunday morning, researchers at Tel Aviv University presented a new study on the timeline of earthquakes throughout history. No precise future earthquake dates can be extrapolated from the data, of course, but the researchers say one is on the way - as no major quake has hit the danger area between the Dead Sea and the Kineret in centuries. "It's like the first winter rain," said Dr. Shmuel Marko, who took part in the study. "The longer the dry summer lasts, the closer the first rain is. Here, as well: The quiet is worrisome. The longer we go without a large quake, the more we can expect one." On the other hand, experts have said that Israel's earthquakes are in general less frequent than those in other quake-prone regions such as California, Japan and Turkey. Israel is located along the Syria-Africa rift, a friction point between two subterranean plates and is therefore considered earthquake-prone. In 1927, some 250 people were killed in an earthquake that hit Jericho and central Israel. In November 1995, a 6.2 quake caused injuries to several people in Eilat. A minor quake, 5.0 on the Richter scale, hit Israel in February 2004, shaking buildings in many cities and even causing damage to the Knesset building. No one was reported hurt. The northern city of Tzfat was hit by two earthquakes in recent centuries, in 1759 and in 1837. The latter one killed at least 2,000 people, when residents were buried under the ruins of their homes and help did not arrive for days. Yes, great earthquakes are on the way. This generation of secular Jews living in the Holy Land are responsible for bringing upon the entire planet the beginning of sorrows! The great God of the Bible will not be mocked. The giveaway of Jerusalem, and sovereignty over the Temple Mount is an evil which will not go by without consequences. The love affair with the blasphemous Road Map reflects on this generation's rejection of the Bible. The lip service of all these phony Jews and Christians will not be tolerated much longer. Hearts must be changed! It is far better to submit to His mercy and grace then to be broken by His chastening hand. What is meant for chastening for a remnant of the elect will be judgment for the masses who will only harden their hearts. Friend, what about you? As the God of the Bible puts His hand of chastening upon you, will you break and submit, or will you only harden your heart. The joy of salvation often comes through great tribulation. When the pressure is on you to come to Christ, how are you going to respond? The Bible is clear that the LORD Jesus Christ took your sin upon Himself so that you can be forgiven and saved. How will you respond to this truth? Will you just harden your heart, or will you come to Him for this precious gift of salvation? JERUSALEM - Secretary of State Condoleezza Rice opened an intense round of Mideast shuttle diplomacy Sunday, struggling to bring Israelis and Palestinians close enough to make a planned U.S.-hosted peace conference worthwhile. The two sides are at bitter odds over an outline of a peace agreement that would be presented at next month’s conference, and Rice sought to lower expectations her mission would finalize preparations for the gathering. Underscoring her less-than-optimistic assessment, Israeli and Palestinians traded shots about the other’s commitment to peace even as she arrived in the region. During her four-day visit, she will bounce between Israel and the West Bank, seeking a consensus. Her hope is to close the gap as Israel and the Palestinian Authority try to forge an outline of an eventual peace deal and produce a joint statement for the conference. It is expected to held in Annapolis, Md., in late November. But after Rice’s first series of meetings, a senior State Department official hinted that the date could slide as the lead negotiators for the two sides will begin only this week to try to craft the document. (IsraelNN.com) US President George W. Bush said a nuclear Iran would mean World War III. Israeli newscasts featured Gog & Magog maps of the likely alignment of nations in that potential conflict. US President Bush said Wednesday during a press conference that Iran attaining nuclear weapons raises the risk of "World War III." Russian President Vladimir Putin visited Iran Tuesday and slammed the US’s refusal to rule out the use of force against Iran’s nuclear project. "Not only should we reject the use of force, but also the mention of force as a possibility," he said. Russia has blocked tougher UN sanctions in the UN Security Council, where it has veto power. The Russian president asserts that there is no evidence Iran is pursuing nuclear weapons rather than a peaceful nuclear power program. Israel’s Foreign Minister Tzipi Livni called for a new Security Council resolution against Iran at a press conference following her meeting with US Secretary of State Condoleezza Rice Wednesday. "I do believe there is a need for another Security Council resolution,” she told reporters. “In the past, the need to get everybody on board - including Russia and China - led to some compromises on the nature of the sanctions. I hope this will not be the case this time." Prime Minister Ehud Olmert announced Wednesday a sudden trip to Moscow Thursday morning, where he will meet with Putin about Iran. Other topics of discussion will reportedly be Russia’s continued supply of weapons to Syria, which have then made their way into the hands of various terrorist groups based there as well. It is a Biblical stretch to include China, and North Korea in the Ezekiel 38, 39 prophecy of the coming invasion of Israel. It is even a further stretch to call this coming invasion World War Three. It ends quicker then it starts. It is clear to me this will be an Islamic Jihad type invasion of Israel, and the invaders coming from the North, East, and South meet a supernatural judgment the moment they cross the boarders of Israel. The invading armies are devastated in an instant, and become fodder for the beasts of the field, and fowl of the air. Ezekiel 38 & 39 describes the forever end of Islamic influence over the Middle East. Ezekiel 38 & 39 describes how God is going to open the door for the Jews to build the last Holy Jewish Temple to stand on the Temple Mount. The Temple that must be standing when the LORD Jesus Christ returns to establish His Kingdom of Heaven here on earth. He is coming again as the King of the Jews, and will rule the entire planet from the Holy Land, at Jerusalem, and on the Temple Mount. It is the Bible, not the Koran that will remain the Book of the Holy Land. Judgment is coming to the Jews and the gentiles. Are you ready? Even the secular media recognize how current events taking place today are falling into line with what the Bible has long ago prophesied. We are all guilty of sin, and ripe for judgment. The Bible teaches that those who repent in coming to Christ will find Him as a refuge. All others will be judged according to their sin, and cast into hell. The Christ of the Bible is the only person ever to claim He is the Son of God. Friend, He is the Savior! Come to Him now before it is too late. Come to Christ, and live! (IsraelNN.com) The unauthorized dig of a trench this past summer by the Moslem Waqf on the Temple Mount, in the course of which it was assumed that precious findings were destroyed, apparently had a thin silver lining. Israel Antiquities Authority (IAA) personnel monitoring the trench-digging have, for the first time, found traces of the First Temple. The IAA studied an archaeological level dating to the First Temple Period, exposed in the area close to the south-eastern corner of the raised platform surrounding the Dome of the Rock. Archaeological examination of a small section of this level, led by Jerusalem District Archaeologist Yuval Baruch, uncovered fragments of ceramic table wares, animal bones, and more. The finds date from the 8th to 6th centuries BCE; the First Temple existed between the 9th and 5th centuries BCE, having been built by King Solomon in 832 and destroyed in 422. The archaeological team - Baruch of the IAA, Prof. Sy Gitin, Director of the W. F. Albright Institute of Archaeological Research in Jerusalem, Prof. Israel Finkelstein of Tel Aviv University and Prof. Ronny Reich of Haifa University - reached the conclusion, after examining the finds and archaeological data, that their characteristics and location may aid scholars in reconstructing the dimensions and boundaries of the Temple Mount during the First Temple Period. The finds include fragments of bowl rims, bases and body sherds, the base of a juglet used for the ladling of oil, the handle of a small juglet, and the rim of a storage jar. The bowl sherds were decorated with wheel burnishing lines characteristic of the First Temple Period. The IAA announced that it will shold an archaeological seminar concerning these finds and their archaeological interpretation at a later date. Muslim scholars often deny any Jewish claim to the Temple Mount, and it is often charged that Arab excavations there are employed for the purpose of throwing out truckloads of artifacts that would prove otherwise. Moslem claims to the Temple Mount, on the other hand, have been debunked even by other Moslems. A commentator for the official Egyptian government weekly, of all places, has written that the entire Moslem claim on Jerusalem and the El-Aksa mosque is based on a mistaken reading of one chapter of the Quran. Ahmed Mahmad Oufa wrote that the verse that mentions a night journey by Muhammed to a mosque has nothing to do with Jerusalem, as is generally claimed, but with a mosque near the holy Moslem city of Medina. "All in all, this is not a new claim. We must remember that Jerusalem is not mentioned at all in the Quran [though it is mentioned hundreds of time in the Bible - ed. note]. The verse in question is in Sura [chapter] 17, which states that Muhammad was brought at night from one mosque to a 'more distant' - aktsa, in Arabic - mosque. The first Moslem commentators did not explain this as referring to Jerusalem at all, of course, but rather as a miraculous night journey or night vision or some such. In the beginning of the 8th century, however, they began associating this with Jerusalem, because they had a need to start giving sanctity to Jerusalem, and so they started connecting this verse with Jerusalem... Originally, however, the Moslems recognized the area of the Dome of the Rock as holy because of the Jewish Temple of King Solomon." Mount Zion is a part of Mount Moriah upon which the city of Jerusalem is built. It covers the highest point of Mount Moriah (where Herod built his palace) to the edge of the precipice of the Temple Mount where the Kidron and Hinnom Valley's converge (where Satan tempted Christ). The Holy Jewish Temple built a little below Moriah's peak has always been the glory of Zion, and the word Zion and the word Holy Jewish Temple are often used in the Bible synonymously. The outcropping around where the Holy Jewish Temple was built is also the same spot where Abraham was going to sacrifice Isaac until God intervened with a substitute Ram. What God could not allow Abraham as a father of an only son go through, He Himself provided no substitute for His Christ. The universal plan of the Great God of the Bible was that an atonement had to be made for lost sinners, or all would perish. This one spot on the entire planet was designated to forever represent the atonement for sin, and the price God was willing to spend so salvation could be offered. This is what the Holy Jewish Temple standing in this single place always represents! I slam is a false religion Satanically inspired through the auspices of the Arab Mohamed who read the Bible, and rejected both Old and New Testaments. He substituted the loving just God of the Bible with Allah the god of the barbarians who inspires his followers into such barbaric acts as suicide bombings of innocent civilians. Allah is not 65he God of Abraham, Isaac, and Jacob, but the Arabic god of Abraham, Ishmael, and Esau. The Koran falsely substitutes Ishmael for Isaac in it's account of the sacrifice of an only son. The followers of Allah have no problem with lying, and all evidence that points to the Bible as true, and the Koran as wrong is destroyed or denied. This is what happened when Islam tried to dig an illegal trench on the Temple Mount. What they uncovered was evidence substantiating the First Holy Jewish Temple's existence. Islam rejects the Jewish/Christian Biblical teaching of blood atonement for the forgiveness of sin, but rather glorify the horrific acts of Islamic terrorists as earning the false Islamic sexually perverted paradise. Friend, I pray you have the discernment to see where the truth is taught. Come to Christ, and live. (IsraelNN.com) A historic first: Last week, during a special visit to the Temple Mount, the Priestly Blessing (Numbers 6:24-26) was recited there, for arguably the first time since the 1st-century destruction of the Second Temple. The Priestly prayer offered on the Temple Mount came just in time. The backlash to the Olmert plan to divide Jerusalem, and give the barbarians the sovereignty over the Temple Mount has risen quickly since the prayer was uttered. Condoleezza Rice is backpedaling realizing that the up-coming Annapolis Conference aimed at pushing forward the blasphemous Road Map is going bust. Even the secular Jewish Ksennet has risen in opposition to the Olmert give away voting unanimously crossing party lines that Jerusalem must never be divided, and the Temple Mount must always remain in Jewish hands. Friend, there is a Great High Priest ready to bless you with the greatest blessing of all time. He offers you by grace the gift of salvation. His blessing is available to every one willing to come. None will be refused because the blessing is by grace. It is a free gift. The price needed to forgive sin was paid at Calvary. The only requirement is that you humble yourself, and come! Friend, won't you come to Christ today? The Jerusalem Institute for Israel Studies (JIIS), a prominent think tank which previously proposed ideas for how to divide Jerusalem that were used as a basis for negotiations at the failed Camp David summit in July 2000, is now having serious reservations about dividing the city. In a new report about to be released on the question of Jerusalem, the former advocate of division has reversed its stance based on numerous security, social and economic reasons, including the need to possibly compensate east Jerusalem Arabs for their loss of jobs and government benefits similar to the packages promised to the Gaza evacuees. Alleluia, the LORD God Omnipotent reigneth! He puts fear in the hearts of those who oppose His will, and in this case these secular prestigious Jews have done a 180. The issue God used was the Biblical City of Jerusalem. The reality of their actions over the Holy City has caused these pompous politicos to reverse their former attitude. The liberal support Olmert once had is fading fast. They are all jumping ship, and the issue is a divided Jerusalem. The glory of Jerusalem has always been the Holy Jewish Temple. This issue is also bright in the minds of the Jews living in the Holy Land. This generation of the miraculous Third Exodus are averting what would have been the greatest insult to the God of Abraham, Isaac, and Jacob that they have contemplated. Just as the Holy God of the Bible opposes the division of Jerusalem so also does He oppose the division of the Holy Land. The blasphemous Road Map that so blinds our Evangelical White House is bust again. The Annapolis Conference built around dividing Jerusalem so the Road Map could go forward now seems a bust! The secular liberal Jews are refusing to bend to the US pressure, and are abandoning the Road Map in groves. Friend, what about you? Are you ready to reverse course, and come to Christ? He bore our sins at Calvary. The only requirement grace demands is that you come, and accept the free gift of salvation. The offer is free, but you must accept it. Won't you come to Christ? IsraelNN.com) The mayor of Umm el-Fahm, Sheikh Abd el-Rachman, demands that there be no further discussion of the idea of transferring jurisdiction over a predominantly Arab area in northern Israel ("the Triangle") to the Palestinian Authority. "Transfer of the Triangle would be new 'Nakba' for us," he said, employing the term the Arabs use for referring to the Israeli War of Independence. In a letter to Prime Minister Ehud Olmert and PA Chairman Mahmoud Abbas, Rachman explained that "we refuse to be merchandise that is offered for sale or for buying, and any change in our situation is a 'nakba' and is contrary to all treaties and laws." The backlash against a divided Jerusalem is expanding from just the city to the entirety of the Holy Land, and it is the Islamic Arabs living in the Holy Land who are leading the opposition. They have experienced the peace that was theirs under Israeli rule, and they watched the chaos of Gaza when the PA, and now Hamas took control. These Islamic Arabs are smart enough to know what is best for their families. They know once the PA takes control, or any other terrorist oriented Islamic group, that the masked thugs who show no mercy will rule the streets. Hard working Arabs will be extorted of their earnings so the thugs need not work. Any resistance will find the charge of collaboration with the Jews being made which is a death decree. No trials, just off with their heads in front of their horrified families. It does not take a vision from God to open the eyes of these Arabs to the truth. Friend, what about you? Are your eyes open to the truth? With this miraculous Third Exodus a new dispensation is unfolding. The Jewish Kingdom Age. The LORD Jesus Christ is preparing the way for His return to the very spot from where He left. His feet will touch down on the Mount of Olives. He will cross the Kidron Valley entering the city of Jerusalem. He will enter through the East Gate into the Last Holy Jewish Temple yet to be built on the Temple Mount. He is coming as the LORD of hosts. The King of the Jews. The Jews themselves will accept Him as their Messiah and Savior. The light to the Gentiles will be uncovered, and the prisoners of sin will find freedom in this same Biblical Christ being proclaimed today. Friend, are your eyes opened? Do you understand? Come to this Christ with all your heart, soul, and might. A new life awaits all who come. Oh friend, won't you come? Sabri repeated claims that no Jewish Temple had stood on the Temple Mount, saying the idea that a Temple had stood there was a “Zionist trick.” The Kotel (Western Wall) is “just the western wall of the mosque,” he said. The Islamic religious leaders not only claim that a Jewish Temple built on the Temple Mount is a Zionist plot, but they actively teach that the Bible itself is another example of that same Zionist plot. They want the world to reject the Bible for the Koran! They want the words of that blasphemer Mohamed to replace the words of the LORD Jesus Christ! They want the world to worship the Arabic god Allah, the god of Abraham, Ishmael, and Esau, to replace the Biblical Jewish Christian God of Abraham, Isaac, and Jacob. They want the world to reject the truth, and believe the lie! These Islamic blasphemers so blinded in unrighteousness because of their barbaric hate for Christians and Jews think everybody agrees with their lies. The Jewish Christian God of the Bible has a very different plan then does Islam for His Holy Mountain! It is to be the place for His House of Prayer for all people. Never will Jew, or gentile be denied prayer. Never will phony religious leaders be allowed to control what is true Biblical righteousness. A new dispensation is almost here. The LORD Jesus Christ is coming again. Islam is about to face the righteous judgment of the only true God of all creation. The works of this generation of Moslems will be their condemnation. Friend, condemnation for sin will be your demise also. It is only in Christ that any of us have a refuge. He shed His blood at Calvary so atonement for lost sinners would be acceptable. The price for sin has been paid. Now it is up to you to receive this free gift. You must come to the one who sacrificed Himself on God's altar of the cross. It is not religious. It is very personal transcending all manmade religions. It is coming to the personal Christ of the Bible who is soon coming again. Friend, won't you come to Him in true repentance? Won't you come with all your heart, soul, and might? He promises He will not refuse even the worst of us who can humble their self, and come. Hamas took responsibility on Friday for a shooting attack near a West Bank settlement in which is an IDF soldier was seriously wounded. Wednesday's attack began at the Ariel junction, where terrorists sprayed a hitchhiking post with bullets from 100 to 150 meters away before speeding down a busy road while firing at passing cars. 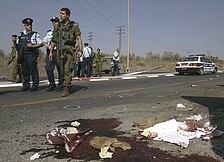 A previously unknown offshoot of Fatah had taken responsibility for the shooting, which also lightly wounded a civilian. But Hamas said Friday in a statement on its Web site that it was responsible. The claim, which appeared to be more reliable than that of the Fatah group, was delayed in order to give the attackers time to evade Israeli security, the group said. Hamas operatives "continue their heroic and high-quality operations to teach the enemy a lesson," the statement said. The shooting, if it was by Hamas, would be significant since the group has not taken responsibility for many attacks in the West Bank in recent months. Security officials have said recently that they suspect Hamas and other militant groups will try to carry out attacks in an attempt to derail a peace conference to be held in the United States by the end of the year. In June, Hamas violently seized control of the Gaza Strip. In response, Fatah dismissed the militant group from a national unity government, and now rules the West Bank by itself. Despite the Hamas acalim of repinsiblity, IDF soldiers said earlier Friday that it shad arrested six Palestinians in the Nablus area on suspicion of involvement in the shooting rampage. The Palestinian Ma'an news agency reported that among the detainees were three brothers, all Fatah operatives. Hamas has successfully expelled the Palestinian Authority from Gaza. Their dogmatic uncompromising hate for the Jews has won the hearts, and minds of the Islamic Palestinian Arabs. They are now preparing to do the same in Judah and Samaria. The Road Map is intent on turning over Judah and Samaria to the same Palestinian Authority that was kicked out of Gaza. The same Hamas that took Gaza from the PA is right now setting up the same overthrow plan that worked so well in Gaza to quickly take over those same parts of the Holy Land. Hamas has daily fired rockets into Israel from Gaza since the take over. These rockets are getting more and more sophisticated. It does not take a rocket scientist to understand what will happen once Islam takes over the sovereignty of both Judah and Samaria. How the Road Map can be called a peace plan goes beyond common sense! Yet, it is the Road Map around which the up coming Annapolis peace conference will be centered. "Neither shall they be divided into two kingdoms any more at all" are the words of God pertaining to the future of Israel. Never again will there be a divided Kingdom! Never again will division demean the testimony of the Holy Land! This statement holds true for the Jews as well as the Land. How blasphemous is the Road Map being promoted by our Evangelical White House that would divide the Holy Land into two diametrically opposed kingdoms. Only one King is going to rule the Holy Land in the Biblical plan, and that is the returning King of the Jews. Friend, do you know this Christ of the Bible? Is He your LORD and Savior? They nailed the indictment above His head on Calvary which read: "King of the Jews!" It was intended to add to His humiliation, but He will boldly wear that title in His glorious return. He is coming again to the Holy Land, Jerusalem, and the Temple Mount. There is still time for you to come to Him for the forgiveness of your sins. The offer of salvation through grace is still available to you. Won't you come to this Christ of the Bible? Israeli Prime Minister Ehud Olmert and Palestinian Authority President Mahmoud Abbas met again on Friday, with Olmert promising not to cause a humanitarian crisis in the Gaza Strip, despite his government's declared intention to carry out power cuts to the territory in an attempt to curb Palestinian rocket attacks into southern Israel. Olmert made the pledge over a two-hour working lunch at his official Jerusalem residence, responding to Abbas' concern that electricity stoppages could hit hospitals and other essential services. The Israeli plan, approved by Defense Minister Ehud Barak on Thursday, is to cut electricity for an initial 15 minutes after a rocket attack. The decision cast a shadow over the two sides' talks, with Palestinian negotiator Saeb Erekat calling it "particularly provocative given that Palestinians and Israelis are meeting to negotiate an agreement on the core issues for ending the conflict between them." Today's meeting was the latest in a series aimed at hammering out differences between the two ahead of a US- sponsored peace conference in Annapolis by year's end. The Palestinians want a joint declaration that addresses all the core issues in the conflict and provides a set timetable for Palestinain statehood. But Olmert is not prepared to go that far yet and has sought to lower expectations for the Annapolis summit. Olmert's spokeswoman Miri Eisin said today that the two sides reaffirmed their commitment to the "road map" to a Palestinian state. Her statement reflects Israel's current position that any decisions at Annapolis must adhere to the road map's order for implementation, a position that Foreign Minister Tzipi Livni presented to U.S. National Security Adviser Steven Hadley on Thursday. The road map requires Palestinian security forces to first undertake continuous and effective operations to counter terrorism in the territories before Israel is obligated to carry out any steps towards Palestinian statehood. Olmert is so blinded by the Road Map that as he negotiates for this phony peace plan he makes a covenant with the enemy that he will do nothing to stop the daily rocket attacks coming out of Gaza. Islam now knows they have a green light to rocket attack the Independent Fundamental Jewish settlements near the borders. Olmert already has promised he will expel over 250,000 of these settlers now living in Judah and Samaria so the Road Map can go forward. I'm sure he will resettle them on the newly formed borders between the Palestinian Authority's new kingdom, and Israel. They will be fodder for more rocket attacks from the newly formed Islamic kingdom planted in the Holy Land. This all thanks to the Road Map. It was the Road Map that forced Sharon to give away the Gaza to Islam. The rockets were the thanks Islam sent to the Jews for their one sided withdrawal. The whole world has witnessed the failure of the Gaza withdrawal. Yet, the Road Map continues to be the only peace plan the politicians can produce. The blasphemous Road Map has turned the Holy Land into a terrible boggy quagmire! Folks, we are obligated to oppose the Road Map. Dividing Jerusalem, dividing the Holy Land, under the auspices of peace is purely secular political horse poopky. We can't hide from reality. We must do what we can to lift up the truth about what the Bible teaches in regards to the future of a united Holy Land. The Road Map is a blasphemous plan that goes counter to everything the Bible teaches. We must stand against those Evangelicals who would divide the Holy Land letting Islam substitute the Koran for the Bible. We must stand as the old fundamentalists stood on Biblical principals. (IsraelNN.com) Palestinian Authority Chairman and Fatah leader Mahmoud Abbas says that rival Hamas terrorists are planning to overthrow his government in Ramallah and take over Fatah-controlled Judea and Samaria. Abbas made the statements Sunday night in an interview with the Jerusalem Post and accused "international parties [of] supporting Hamas in its effort." Abbas aides said the PA Chairman was referring to Iran, Syria and Qatar. "We have information that Hamas is planning to copy the (June 2007) Gaza coup in the West Bank," Abbas said, adding that he believes the plan will fail. He stated his willingness to resume negotiations with Hamas when the terror faction relaxes its chokehold in Gaza. Hamas spokesman Fawzi Barhoum denied the charges, accusing Abbas of covering up "crimes" carried out by his "militias" against Hamas supporters in Judea and Samaria. Barhoum also claimed Hamas was "forced to take security measures in the Gaza Strip to stop Abbas's forces from carrying out the Zionist-American plot to overthrow the democratically-elected [Hamas] government." The PA Chairman also charged Hamas and Israel with holding separate talks, and said Hamas leaders must publicly admit their involvement with Israel. The Olmert administration previously has stated it is against any contact by Hamas with Jerusalem or with the PA.
Hamas won control over the PA government in a landslide victory at the polls in January 2006, and Hamas Chairman Ismail Haniyeh became PA Prime Minister. Abbas remained as PA Chairman. Fierce clashes between the two factions followed the elections and repeated attempts by local and international figures to resolve the differences between the two – including a Saudi-sponsored summit that led to a brief unity government – ultimately failed. Many donor nations to the PA withdrew their support when Hamas, which is classified as a terrorist organization in the United States and other Western nations, was voted in. After Hamas took over Gaza and expelled Abbas's forces in June, 2007, Abbas retaliated by dissolving the unity government and installing an emergency government in Judea and Samaria. Abbas won back financial and political bounty from Western nations by declaring that he would keep his distance from Hamas. Recently there have been whispers that Fatah is negotiating secretly with Hamas to repair its relationship, an allegation denied in a lukewarm statement by Fatah spokesman Ahmed Abdel Rahman, who admitted several Arab and Islamic countries were mediating between the two factions. This is the generation of lies and iniquity. God well knew the dominating character of both Jew and gentile. The politicians of this generation have outdone all their predecessors in deception. It is so sad to daily read of agreements blatantly broken the very next day. It is clear the promises made were lies from the beginning. The politics over the Holy Land lead the way in this plague of deception. There is a new style of ethics which is no ethics at all! The Bible states the reason is because they don't know God. Neither the secular Jewish politicians, or the Islamic leadership know the God of the Bible. There are none who can be trusted. They truly weary themselves in practicing political iniquity. Secret back room deals are commonplace, and even then the politicians can't be trusted to keep their word. The clearest message coming from the Islamic Arab populous is that they support the worst terrorists on the political stage. It should be abundantly clear that Hamas will rule Judah and Samaria in the end. Whatever is given to the Palestinian Authority through the Road Map is given to Fatah whom the United States is now training to be the police force of the Palestinians. These corrupt thugs have so soured the Arab populous over the years of Arafat's rule in Gaza that Hamas now has the upper hand in the battle for the hearts and minds of the people. The acceptance of the Jewish State of Israel is completely out of the picture. Hamas won't even lie over this issue as does Fatah to the Western press. All the flurry of recent negotiations taking place will have only one end if successful, and that is that the barbarians will have a kingdom in the Holy Land from where they will forever terrorize and murder Jews. Friend, do not let the world, the flesh, or the devil rob you of the Salvation offered so freely in the Bible. Come to Christ, and live! (IsraelNN.com) Officials from Palestinian Authority terrorist factions met in Damascus Monday with Iranian Foreign Minister Manouchehr Motaki to discuss the situation in Gaza and the upcoming U.S.-sponsored Mideast summit. According to a member of the Iranian delegation who spoke on condition of anonymity, Motaki met with Hamas deputy politburo head Moussa Abu Marzouk, Islamic Jihad leader Ramadan Abdullah Shallah, and PA officials. Members of Syrian-based PA terrorist factions who oppose the Israel-PA talks and who were not invited to the conference in Washington will hold their own meeting in Damascus on November 7. Officials from PA Chairman and Fatah leader Mahmoud Abbas's faction are trying to convince Syria to cancel the Damascus conference, saying it will undermine Fatah's influence among the PA population. Motaki's discussions Tuesday with the PA terrorist factions followed meetings Monday with Syrian President Bashar Assad and Foreign Minister Walid al-Moallem. Syrian and Iranian leaders are seeking to strengthen bilateral ties. Israeli security officials are worried about the impact of the "triad of terror" on the ability of the Jewish State to ward off attacks from Gaza, noting that Hamas operatives have been receiving advanced terrorist training in Syria and Iran. Three IDF soldiers were killed during counter-terrorism operations in Gaza in the past three months, a toll that has not gone unnoticed by the defense establishment. A plan to cut fuel supplies to Gaza after a rocket attack is launched from the region was passed by the cabinet but put on hold by Attorney General Menachem Mazuz until humanitarian guidelines are worked out. A barrage of Kassam rockets were fired at the western Negev midday Tuesday. One slammed into a building in the city of Sderot, located barely a kilometer away from Gaza. No one was physically injured, although the structure was damaged. Two other rockets landed in open areas. Two rockets exploded earlier in the day in a western Negev kibbutz, damaging a building but hurting no one. There is good reason why this secular generation of Jews are facing such murderous plotting from their Islamic enemies. It goes right to the heart of their attitude toward the Holy Land, Jerusalem, and the Temple Mount. God has brought about this miraculous Third Exodus during our generation for the single purpose of changing dispensations. The Church Age is ending, and the Jewish Kingdom Age is about to begin. The Great God of the Bible has determined that the Jewish heart which has so long been in darkness should soon come into the light. It is going to take great tribulation to break the hard hearts of the blinded Jews of today. They must be driven to the truth that the LORD Jesus Christ is their Messiah! They must be driven to their knees in repentive heart break for having rejected Him for so long. Folks, this is exactly what is happening in the Holy Land today. Dispensational change is in the works. Great Tribulation is on the way. The Jewish heart is being prepared to turn to the LORD Jesus Christ. He is coming again to the Holy Land, Jerusalem, and the Temple Mount! Oh friend, do not follow the way of the detestable of this generation. A new heart, and a new spirit can be yours right now if you will only come to the Biblical Christ. The Christ who sacrificed Himself at Calvary so the single perfect atonement for sin would be offered. The free gift of salvation is being offered to you right now. Won't you come to this Christ of the Bible, and live?